Sancti Spiritus are the new Liga Superior de Baloncesto Champions! 83:72, while Guantanamo beat Santiago 69:64. Trailing 13-22 at the end of the first period, Guantanamo fully dominated the second half. They posted an 18-12 run in the third quarter and closed the game with the final 23-13 surge. On Friday Sancti Spiritus overcame Pinar del Rio 73-63 and Guantanamo beat Santiago 69:58. Capitalinas keep the perfect record at the Liga Superior de Baloncesto. They edged Ciego de Avila 108-61 in the latest game. Suchitel Avila (184-F/C-82) stepped up with 20 points and Yaisel Fraguela netted 17. Taimaris Millen poured in 11, whilst Dailis Tornel netted 10. Sheila Molina replied with 20 points in the losing effort. 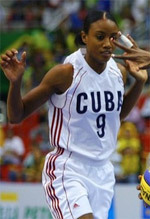 Sancti Spiritus (Liga Superior) inked 33-year old Cuban international power forward Yamara Amargo (179-85, agency: Pro Sports). It is actually her comeback to Sancti Spiritus as she has played here before. Amargo played in the summer at Santa Tecla BC in Salvadorean Liga Mayor. In 17 games she averaged impressive 28.3ppg, 9.5rpg, 2.4apg and 1.8spg. She helped them to win the Liga Mayor Clausura title. A very good season in her career as she was selected to Latinbasket.com All-El Salvador Liga Mayor Clausura 1st Team and League Player of the Week (2 times). 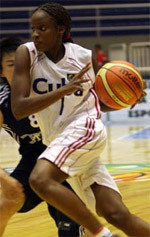 Amargo also represented Cuba at the Centrobasket in Manati (Puerto Rico) last year. Her team won Silver and her stats at that event were 4 games: Score-2 (18.0ppg), 5.0rpg, 1.5apg, FGP: 44.8%, 3PT: 40.6%, FT: 70.0%. Amargo has played previously professionally in Venezuela (Bucaneras) and Cuba (Villa Clara). Her game is described as: A powerful, very experienced front court player with great offensive moves and scoring touch. A very experienced foward with a devastating inside-outside game. She's strong and very effective near to the basket even being a little undersized, and can be a serious threat from both sides of the three-point line.